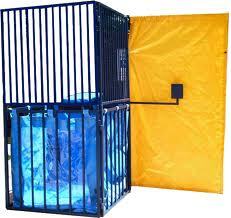 Dunk Tank Rentals are the perfect addition to any fundraiser event or corporate event. Also great for carnival themed parties! It's a fun and popular way to raise money at fundraisers and who doesn't want to try to dunk the boss at a corporate event? Water to be provided by customer and must be drained before pick up.